New market entrants have emerged in the world of pay TV and profoundly changed the competitive landscape for operators. Very few pay-TV operators would have assumed that today people would be purchasing premium video content from the same companies that used to sell them books and DVDs online! But this is the case, and as it is a trend that will likely accelerate, pay-TV operators need to find new ways of competing more effectively with these new entrants. The answer appears obvious to us here at Zenterio – we see a need for operators to emulate the best features and functionality of these new competitors while leveraging what is unique about their own market position. By taking a series of coherent steps, we believe pay-TV operators can overcome a crisis of confidence and not just respond to this competitive threat but actually neutralise it. Data is valuable but consumer trust is priceless. The rich data captured by pay-TV operators provides a holistic view of all content, service and application consumption on their platforms as well as metrics around quality of service and experience. Nobody has the trust level with respect to their consumer data that operators have. These are typically telecom companies that have established multi-generational billing relationships with each family unit. This is unique, as few of the new market entrants have this depth of data, and we would argue none have the implicit consumer trust that goes with it. Using this data to gather insights, drive efficiencies and generate new revenue while maintaining trust is key for operators. Great user experience is a winner. The user experience from new entrants is incredibly strong – it is fun, engaging and easy to interact with. The most successful operators have focussed on emulating the best features and functionalities of the new market entrants to stay competitive. In this case, imitation is truly the sincerest form of flattery. Super simple search and discovery is the first step, but interaction beyond the constraints of the remote control, for example through voice, makes for a fun experience that drives use of the operators’ offering instead of that of the new entrant. Broadest Content Offering is a Differentiator. The strongest basis for competition is to offer the widest possible breadth of content and service to the home. Implicitly, this requires that pay-TV operators embrace OTT and catch-up or other VOD services. Operators are generally overcoming concerns around the carriage of third-party content or content that might be perceived as competing with their own offering. The go-to service in the home will be the one that provides easiest access to content that meets the broadest needs of consumers in the home. It’s No Longer About the Hardware. Pay-TV operators continually groaned about the capital expense of putting hardware into their subscribers’ home. Moreover, they felt that if they paid for it, they should control every aspect of it, which slowed down innovation and constrained capacity. Gradually, new devices have been introduced into the home, replacing old operator provisioned devices, like set-top boxes. We are seeing a fundamental shift from hardware-based competition to software. Now it is more about ensuring a consistent user experience and quality of service, irrespective of device. Operators have become increasingly hardware agnostic by embracing all types of hardware, and means of consuming content, in the home. They now project control in the home through software rather than hardware. ARPU Matters but it Comes from Many Sources. We are big believers in helping operators deliver new ARPU, in particular from implementing advertising and content promotion on their platforms using our technology. Yet, there are additional ways to increase ARPU. For example, many operators monitor and actively manage user experience across all usage, from broadcast to OTT to applications, and can proactively make changes to deliver a better viewing experience. Happier customers reduces churn, mitigates or avoids new subscriber acquisition costs and therefore improves customer margins. Measurement of the macrocosm provides insights that are capable of making significant financial improvements to operators’ businesses beyond the obvious! In conclusion, this new competitive environment is most relevant to incumbent telcos that see video as a central plank in their triple- and quad-play offerings. For the more progressive operators, this has led to a shift in how they think about their business and how they compete. They are using the data they capture in exciting new ways to reshape their businesses, they are embracing of the macrocosm of content and they are hardware agnostic but extremely software aware. 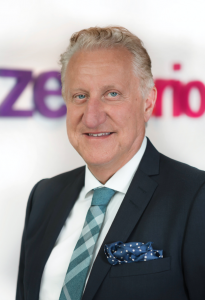 Zenterio is ahead of the curve in helping these operators reach their business objectives. Our continual investment in relevant products and technologies, culminating in the recent launch of Zenterio Cloud, is helping operators navigate this new competitive paradigm.